George Graham Review Andrew and Noah VanNorstrand's "All the Good Summers"
I think that some of the more interesting music being made these days is coming from artists who use the acoustic instrumentation of folk, along with some of the basic hallmarks of traditional music, in creating new original sounds that often incorporate a rather wide collection of influences. Back in the 1980s, what came to be known as New Acoustic music did that with the instrumentation of bluegrass and added in jazz, world music and various other influences. When it was emerging, a lot of the New Acoustic scene music was instrumental. The recent crop of vocal-oriented groups like Crooked Still, the Duhks and the Punch Brothers do a lot of original music and strive for eclecticism. This week we have another fine recording that strongly implies the sound of traditional music in places, and also creates an interesting stylistic mix, from old-time Appalachian to rock to country. It's from a pair of still-young brothers from Syracuse, NY, Andrew and Noah VanNorstrand. Their new CD is called All the Good Summers. The VanNorstrand brothers were immersed in music from an early age. They were home-schooled by their mother who is a full-time classical piano teacher. There was a violin around the house, so the boys took an interest in it and in traditional folk music. Andrew, when he was eight, began taking lessons from a traditional fiddler. Both brothers immersed themselves in the music, and eventually began to try their hand at composing. In 1999, Andrew, the older brother, won a scholarship to attend the Ashokan Fiddle and Dance Camp, founded by Jay Ungar and Molly Mason. There he was exposed to a further range of music including French Canadian and Scandinavian fiddle styles, and both brothers immersed themselves in as many traditional styles as they could. In 2000, the brothers began performing with their mother Kim as the Great Bear Trio, a group that still occasionally tours. The Great Bear Trio released a CD in 2003. Andrew and Noah began working on their own music and released their debut album in 2004. Around that time, the brothers appeared on a Prairie Home Companion on Public Radio in one of the show's periodic talent competitions, in this case, "talent from twelve to twenty." Their following album in 2005 saw the brothers adding more wide-ranging instrumentation from a Swedish nykelharpa to an Australian digeridoo. They were just finishing up high school when they released A Certain Tree in 2007, which featured a mix of original and traditional music. Now they are out with All the Good Summers, with members of their regular touring band, including Noah's wife Kailyn Wright. This time, it's all original music, though several songs sound as if they are very old traditional tunes. With the brothers still spending a lot of time absorbing as many different influences as possible, that eclecticism is apparent on the CD. There's that traditional sound, but there's also a bit of country twang, songs that would work well with an introspective singer-songwriter, some bits of Celtic, and some moments of acoustic jam-band music. While there are those traditional-sounding songs, their material can also run toward art-rock-style complexity with their mostly acoustic instrumentation. The result is a outstanding album that features some worthy acoustic playing but has a lot of musical twists and turns, and variety enough to keep it from settling into any one groove for long. They also include three interesting instrumental pieces. The VanNorstrand Brothers are fine players of almost everything they pick up, including fiddles, acoustic guitars and mandolins. Andrew also plays some electric guitar and banjo, Noah also plays a tenor guitar and does some percussion. The rest of the group on the CD includes Pete Sutherland on keyboards, Kevin Dorsey on acoustic and electric bass, Rachel Bell on accordion, Dana Billings on drums, and Noah's wife Kailyn Wright on additional vocals. 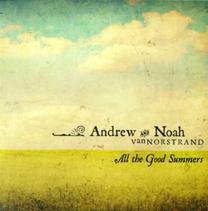 All the Good Summers the new release from Andrew and Noah VanNorstrand is an engaging and thoroughly worthwhile recording that's another example of contemporary musicians creating new music that often sounds traditional, both in terms of the mostly acoustic instrumentation, and in the texture of the songs. Like Gillian Welch, the brothers can compose songs that sound as if they were written more than a century ago. But they are also fond of musical eclecticism, bringing electric guitars, drums and percussion into the mix, and at other times creating music with the elaborate arrangements that are reminiscent of art rock. Despite the mixture of ingredients, the result sounds quite coherent, something further enhanced by the fine musicianship by everyone involved. Our grade for sound quality is an A-minus. The acoustic instruments are well-captured with good clarity and no inappropriate studio effects. Of course, like most CDs these days, the sound was needlessly over-compressed, killing music's the dynamics, especially on some of the more electric tracks such as Elinor. We seem to be in a good period now with a new generation of artists doing creative things with traditional folk influence. Andrew and Noah VanNorstrand are stellar example.